“At 26.9 m. [from Ft. Sumner, New Mexico] is a clump of handsome cottonwoods beside a bridge over an arroyo. These quick-growing shade trees that thrive where other trees can’t grow are a blessing to this land. Cane cactus appears farther on with occasional growths of low pinon and juniper.” From New Mexico, WPA Guide Series, 1940, p. 357. Photo by J. Matthews taken at exact spot of commentary in guidebook, September 2010. 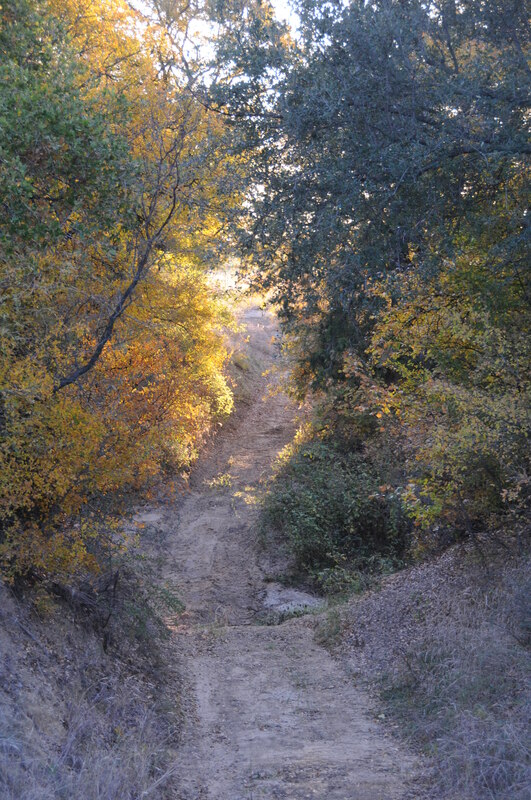 Seventy-years later, cottonwoods remain in the arroyo. All of the horses and dogs are fine. Lilly has recovered quite well from her bad days a few weeks ago and will go into the winter with good condition. The pastures are green from the rain and tree leaves in the grove are turning gold. All is well on the ranch. I will be taking a vacation from blogging and writing posts on Sage to Meadow, a rest under the shade of cottonwoods. It is my intention to resume writing posts about nature on November 1, 2010. 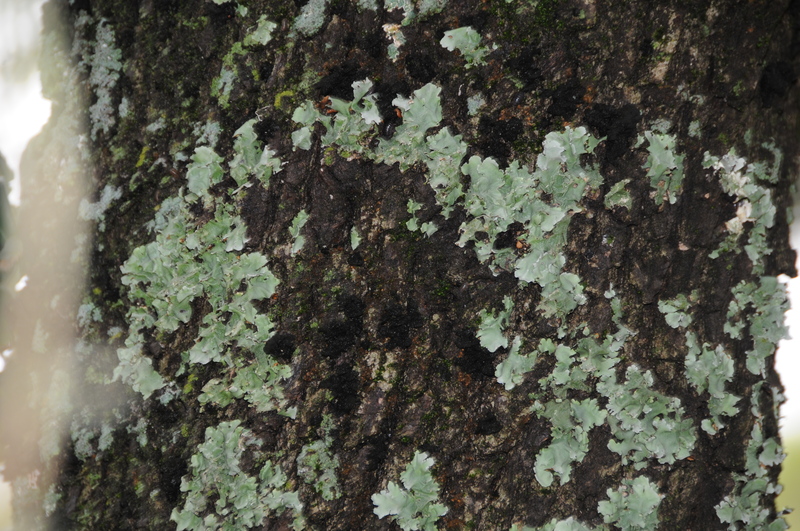 Lichen and moss on the north side of live oak tree in the front yard at Flying Hat. Moss grows on the north side of trees. That’s true in the northern hemisphere. Probably it’s on the south side of trees in the southern half of Earth. We have many oak trees bearing fruit this Fall. Acorns fall from trees abundantly this season. Our car port becomes a tin drum when the acorns fall — about one every thirty seconds at the fastest rhythm. This is a “mast” year for acorns, a season of superabundant oak tree fruit. 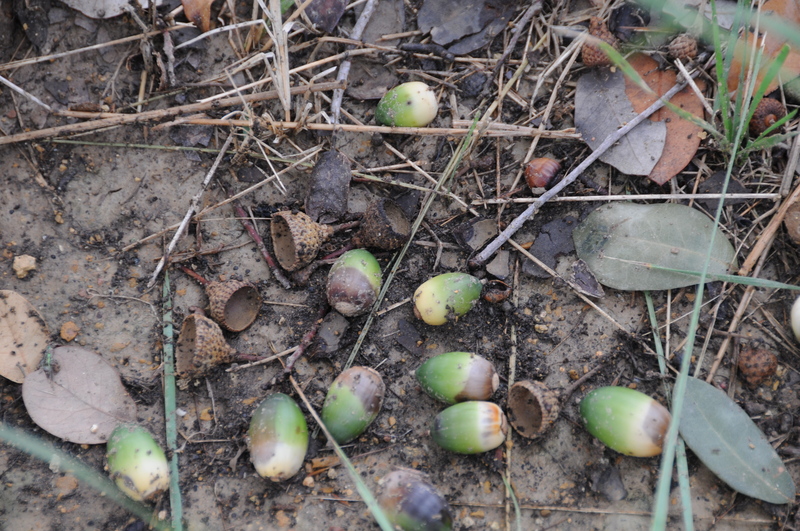 Here on the ranch in prehistoric times, acorns were a staple supply for the Indian. About the ranch house, in the front pastures and around the barn, I have discovered stone tools in abundance: choppers and grinders. It is possible that archeological analysis will reveal Flying Hat a quarry for tool making since non-worked iron ore and meteorite sources are plentiful (1). Horses must be watched lest they overeat acorns. A few nuts will not hurt them. This Fall season the grass is so abundant the horses don’t care about the acorns. During a lean year of grass in the Fall, I have seen Star (levitating and stealth horse) stand beneath an oak tree and wait for nuts to fall, some bonking him on the head, other nuts bouncing off his backside. This year, however, come the browning of the grass, horses must be given ample hay or put in another pasture without acorns. Star would much prefer to be gently pelted with nuts. (1) Archeological analysis in Texas falls under the Texas Historical Commission administration. Contract archeological firms analyze sites. My work in archeological field survey and analysis (I like the fieldwork) stems from my graduate field school tenure at Texas Tech University, anthropology department, under Dr. William Mayer-Oakes. See also Texas Historical Commission, Archeological Subset. You can hear horses nicker and whinny. You can feel the ground shake when they gallop past you in full run. When you are inside a horse trailer with them and they call for their mates, the trailer vibrates with the force of their voice and your ears ring for thirty minutes. Even so, horses are quiet. Really quiet. One story, among many I have, illustrates the stealth horse in every horse that lives and breathes. Air force secret stealth projects have nothing on these guys. Four years ago I was setting up cedar staves between big fence posts on the boundary between our place and a neighbor’s ranch southeast of us. Our small remuda of equine was in the pasture behind me and I was sweating and swearing vigorously in the morning heat. 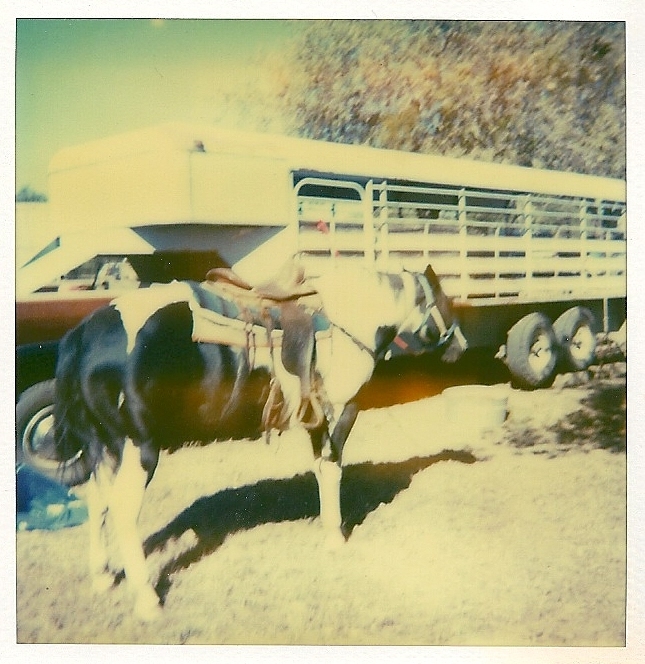 Between me and the horses in the field was a flat-bed trailer. As I stood back from a particularly hard tie of a cedar stave to a five-strand barbed wire fence, I felt this hairy flesh about my neck and shoulder. I was already nervous from fighting yellow-jacket wasps and I had a couple of minor puncture wounds from the barbed wire. What in the world has got me now? It was Star, paint horse gelding! Sneaked up he did, went around the flat-bed trailer, and quietly walked up to my backside! He stood there looking at my work. I’m sure he was real proud of himself having spooked me. I gave him a gentle rub between the eyes. He stood with me for about fifteen minutes while I finished the task and then ambled off, walking around the flat-bed trailer to go munching on bermuda grass. That Star is a stealth horse. Star the stealth horse lying down in the pasture. Star the stealth horse galloping away. 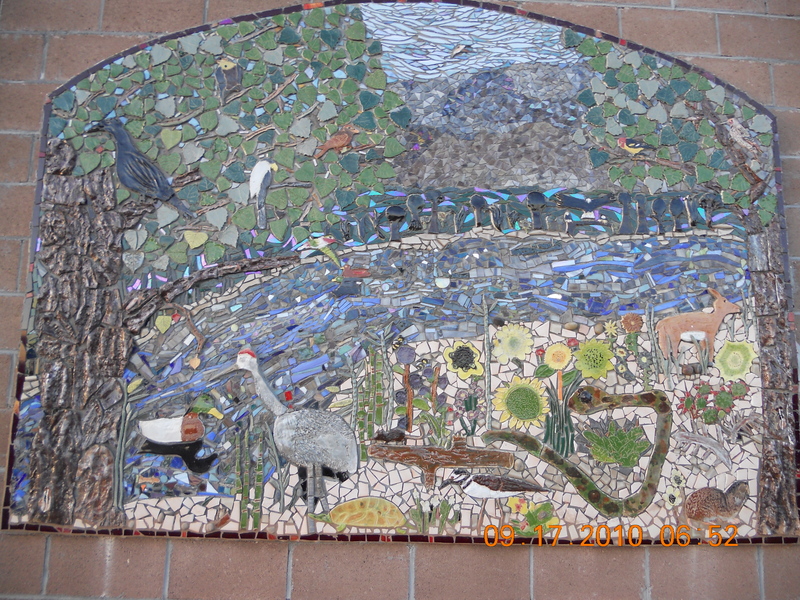 Wildlife Corridors Murals, Albuquerque, New Mexico. Today, September 22, 2010, is the first day of Fall. The sun positioned equally between northern and southern hemispheres today falls to southern skies from today until about December 21, the winter solstice, shortest day of the year. Fall of all the seasons is harvest time, but it is more. It seems to be a time for catching up and preparation. The Winter is coming and windbreaks must be established for the horses and hatchets and axes placed in the pickups to chop the ice from the water troughs. An uptick of hay must be stored in the barn. When it is drier (this season it is not) grass must be shredded in places to stop the spread of wildfire into the woods and structures. A hard look must be given to livestock to affirm they are properly conditioned weight-wise to make it through the winter. If not, then added grain or alfalfa must be apportioned to the weak. Crevices must be stuffed, caulking pressed into cracks. The tire chains must be brought out and placed in the trucks. Summer in most parts of Texas is brutal from 10:30 a.m. in the morning until the long shadows in the evening. Fall, Winter and Spring give comfortable temperatures for outdoor labor and I anticipate Fall coming way back in June. June through the middle of September is a time I tolerate and mechanically toil outdoors. I’m not trying to rush through the Summer, but I am happier when I feel the cool temperatures before daylight in the Fall, as I did this morning, standing in the pasture road looking at the moon, almost full, falling through the mesquite trees on the Dooley place. I have long since passed the time in the Fall when I saw it as a time of playing football or watching the sport. I do occasionally watch games and on Friday nights I see the stadium lights from Gordon and Stephenville and other towns about our region. Interstate 20 is filled with band and supporter buses going to games, intent upon boosting the boys and their play with pigskin. Better to have the game than waste away in destructive behaviors despite the risk of concussions. Fall. I am glad for cooler temperatures and the colors changing in the grove of trees. I hope your first day of Fall is a good day. I know mine is. North Erath County, Texas, Lat 32.43 N, Long -98.36 W, elev. 1,086 ft. Turkey Creek Quad. One week ago, 9:00 a.m., I flushed a large covey of quail to the west of the ranch house. They were feeding under the live oak tree. A single quail sighted a week before the flushed covey. 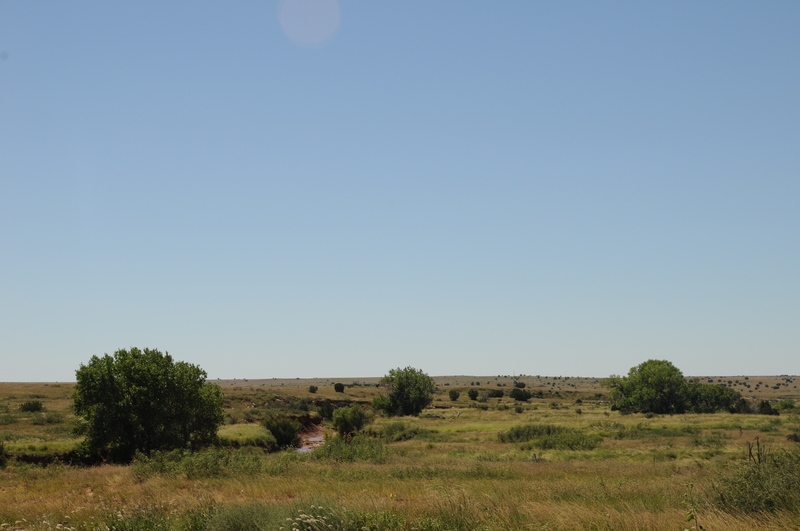 Relinquishing pastures to native grass may have induced quail browsing. Two mornings ago at 5:00 a.m. while walking the Yeller and Lottie, I heard a deer snort over the fence on the Dooley place. Solitary white cow bird sighted two days ago. Cow birds feed with horses in early spring. The four inches of rain two weeks ago has caused greening of all pastures. Pasture grasses, especially buffalo grass, are re-erupting. Yesterday morning at 5:00 a.m., some type of birds quietly chattering in mesquite trees. Quiet chatter. Never heard such a thing before. Harris hawks continue to prey in the pastures. Their flight patterns are low to the ground. Some slight turning of tree leaves in grove to yellow and brown. Overturned soil in arena to soften ground for Lilly and Star. Dove hunters are not so plentiful this year about the county. Few shots heard. Bull nettle growth about stock tank needs cutting. Photograph featured is a cottonwood tree above Casa Sena in Santa Fe. My friend, Crystal Church, and her family in Hermleigh, Texas, have had to put down (tainted words, a flight away from what happens) their Australian Shepherd, Boo, and their thirty-year-old horse, Belle. They will be buried together since the two of them hung out together, conversing through the fence for years. Boo has had mini-strokes over the last few days and Belle cannot make it through the winter on the Rolling Plains, northwest of Sweetwater, Texas, with sharp wind and ice. 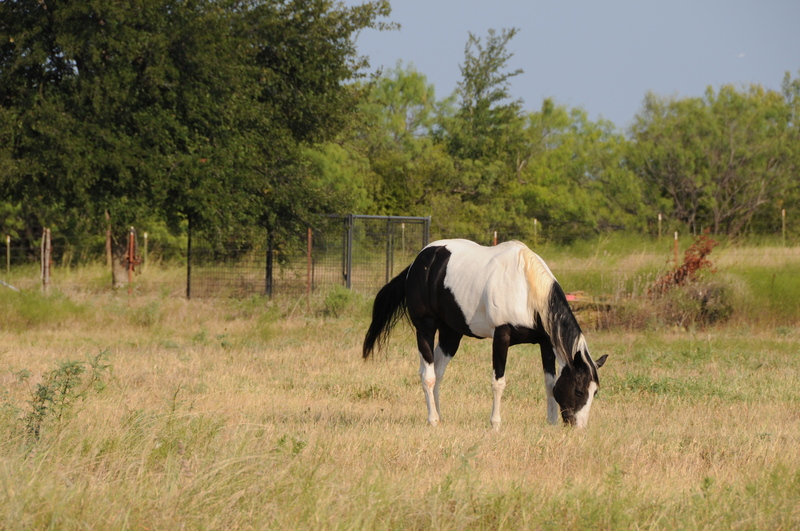 The veterinary has probably come out to their ranch already by the time I write this post and brought an end to the pain these two beautiful creatures have endured of late. When I read my e-mail this morning, Crystal wrote me about this bad day and was there anything I could write or say to help? There was nothing I could say or write, but I tried. My friend, Caralee Woods of Kanab, Utah, once told me upon the death of her adopted dog-companion, Bruno: He went away so as to make room for others. That’s about the best that can be said of this bad day for Crystal and it does not ease the heart like seeing Boo and Belle, conversing through a west Texas fence, spirits smiling. I’m not so sure that we are stronger in our broken places. Crystal’s e-mail at Cisco College where she teaches speech is crystal.church@cisco.edu. 3:30 p.m. I just talked to Crystal and Boo and Belle are gone. The vet came out at 2:00 p.m.
Lilly must have attracted my stepfather because he was always frugal with money and as long as I knew him, J. W. (Jesse Walter) never purchased horses. Until Lilly. He bought her in about 1993. She was eight-years old. 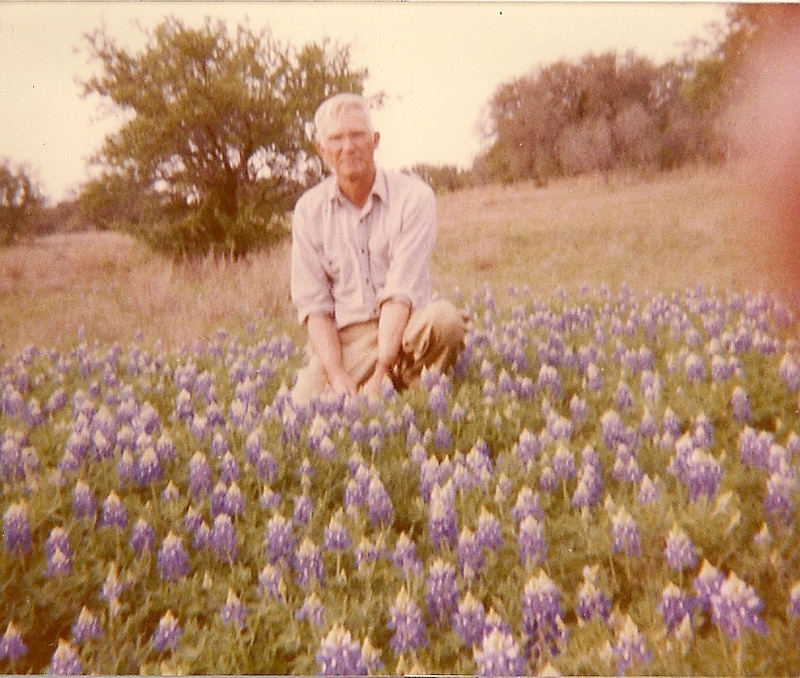 J. W. had married my mother in 1951, worked for Texas Power & Light Company and kept watch over two parcels of land in central Texas: a 35 acre area near Goldthwaite, Texas, and a 13 acre plot, called Salt Creek, near Brownwood, Texas. Lilly stayed, from time-to-time, in both places. Star, her colt, was born at Salt Creek. 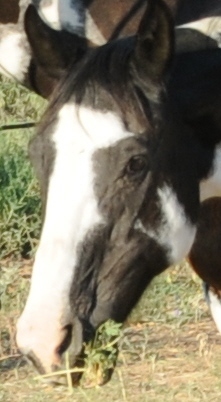 Lilly is a black and white tobiano paint horse. Tobiano indicates a color ensemble of paint horses that is not speckled, like paint that is thrown from a paint brush, but rather broad swatches of color that can be interpreted as representational figures on the horse, as American Indians were wont to do: woman lying down, warrior standing up, galloping horse, and so on. She stands about 14.5 hands, fairly short for a horse, but good for easy mounting and fast breaks and stops. Crazy Horse would have liked her, as he painted hailstones on his mounts and Lilly had broad patches of black. Lilly was J. W.’s trail horse. She would be his ride on daily trail rides around central Texas and may have, on one occasion, gone with him to Colorado for an elk hunt. J. W. did not hunt elk in his later years, preferring to stay back in camp, taking pictures on a Kodak camera and conversing about the fire. Lilly may not have gone with him, but I think I remember her being framed in a photograph in the high country. I first saw Lilly at Salt Creek. She was beautiful. Still is. My daughter rode her when young. Brenda has ridden her and so has Olivia, my granddaughter. I never rode Lilly. For some reason, Star was my steed and when my family rode with me, they chose Lilly and I rode Star. I don’t regret not having ridden Lilly because I am always around her. I have been her keeper since September 2002, when J. W. was diagnosed with leukemia. Twice a day after I moved her and Star to Mingus, I have tended her, groomed her, had her feet trimmed and doctored her bruises and scrapes. When J. W. fell ill and I went to Goldthwaite to feed her the first time, Lilly saw me coming down the pasture road in my little Mazda sedan. She munched a few more bites of grass and then followed me to where I parked. I had a bucket of oats in my hand and when she saw the oats, or smelled them, her head shot up and she rolled her head slightly, giving kicks of delight (I know now) as she walked beside me on my right side to the feed bin. I had not been around horses that much and the kick seemed out of place to me. Horses kick because they are threatened? What is going on with her, I thought? I knew that I was not threatening her and was in the process of feeding, so what was going on? I was a bit fearful of her and moved away. I stopped walking and reflected. Lilly is happy she is being fed, I reasoned, not apprehensive, so, the kick must be a behavior of delight, not attack. A cold, sharp wind cut across the hill to the stock pen where the feed bin was located. She needed her oats, I thought, and I need to become acquainted with her because J. W. can’t come out to Goldthwaite anymore. Lilly stopped when I did. I started walking again and she walked right beside me, a 1,000 lb. sentient being that could hurt me. The whole process of feeding and my stepfather being ill and I had sheep to round up at Salt Creek and I had mother to worry about now since she was in bad health too and I had to drive back to Mingus and teach in Abilene the next morning, all this was on me and now I have Lilly to contend with. I thought I can’t do all this. Cold wind or not, Lilly and I stood together. She wanted her oats. Fair enough, let’s continue. She went down the walkway of the pen and stopped near her bin and I walked between her and the stock fence, inhaling scents of her and the fall season, grasses dying and wind from across our neighbor’s pasture to the north. I poured her oats into her bin and she chomped. Simply ate. And I stood there looking at this beautiful animal. I reached out and touched her, caressed her and she continued to eat, letting me stand beside her. The event of feeding Lilly turned from apprehension to friendship, a subtle first-step in getting acquainted. Because Lilly allowed me to be with her, I reasoned that in the coming weeks I could manage the end-state of my family’s affairs. I would come to the stock pens and feed Lilly and be lightened. J. W. never saw his horses again. I would narrate to him what I was doing, but he was concerned about other things, but I told him anyway about Lilly and Star and rounding up the sheep to sell in Goldthwaite and Star helping cut the sheep into the pen on his own, a naturally penning tendency in some horses. J. W. let me manage the horses and livestock for the first time in our family. In J. W.’s personal effects, there are ribbons and medals and trophies of trail riding with Lilly. They are just courtesy awards given to every trail rider, but the awards signify a bond that goes back in time, back in prehistory when humans approached horses and the horses allowed the touching to occur. Lilly has been a part of our family for seventeen years and I have been her keeper for eight. She’s family. I know now she kicked that first day out of delight for oats and for me. Rest assured, I’ll be with that old girl, all the way to the end, be it a cold day or hot. Ima Lil Moore "Lilly" browsing early in the morning (8:30 a.m.) before going to her loafing area along the fence line. I will be posting on Lilly, our oldest mare in our small remuda. She is twenty-five years old and will turn twenty-six this January. Her registered name is Ima Lil Moore. Her pedigree is found on our ranch website, Flying Hat Horses. 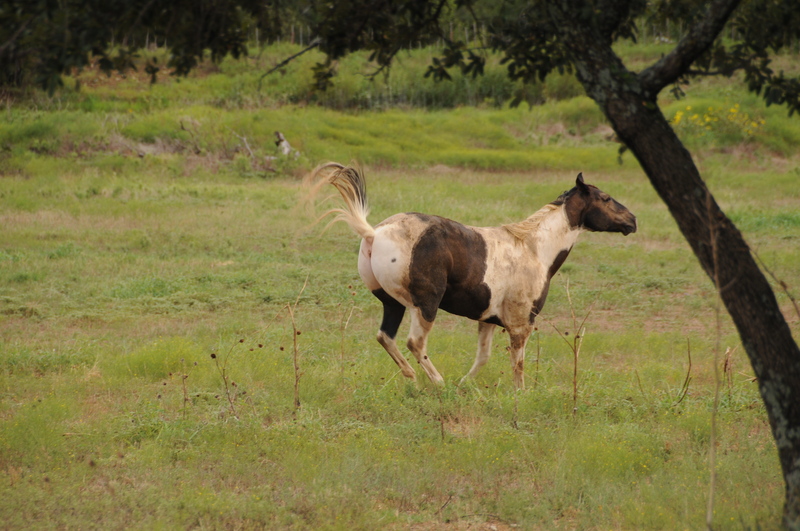 She is a paint horse and the mother of Star, another paint on our place. I am posting on Lilly because she is in good condition going into the winter, but she has osteoarthritis and has trouble at times getting up, a bad sign for a good horse. She is a part of our family. I mean that in the closest sense. She has been a companion for our foals when they were young, a good saddle horse for our grandchildren and a constant companion for me. I want to write about her and explain to you why she is close to me. Today, she rose on her own after I softened the arena so she could get traction. Today, she is fine and I am happy. It’s a good day for her. Remember that: good day. Over the Labor Day holiday, we took a mini-vacation to Santa Fe, stopping on the way to visit my daughter in Lubbock, Texas. 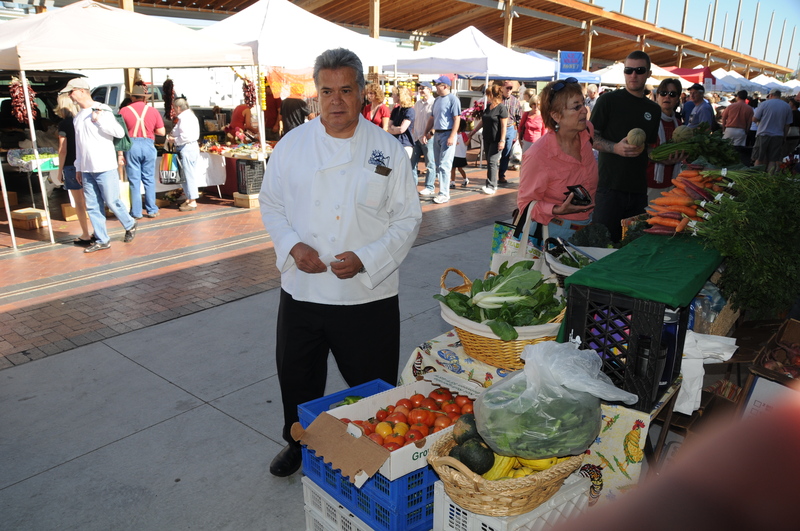 From the first hour we were in Santa Fe, my wife, Brenda, said that we must go to the Farmers’ Market in the Santa Fe rail yard. I was glad we went because the Santa Fe plaza was filled with white-tented craft booths and in the evenings we could not enjoy strolling in the plaza. There was a pleasant display of crafts, but no opportunity to stroll on the plaza. Another evening, another trip for that. So it was off to Farmers’ Market early Saturday morning. 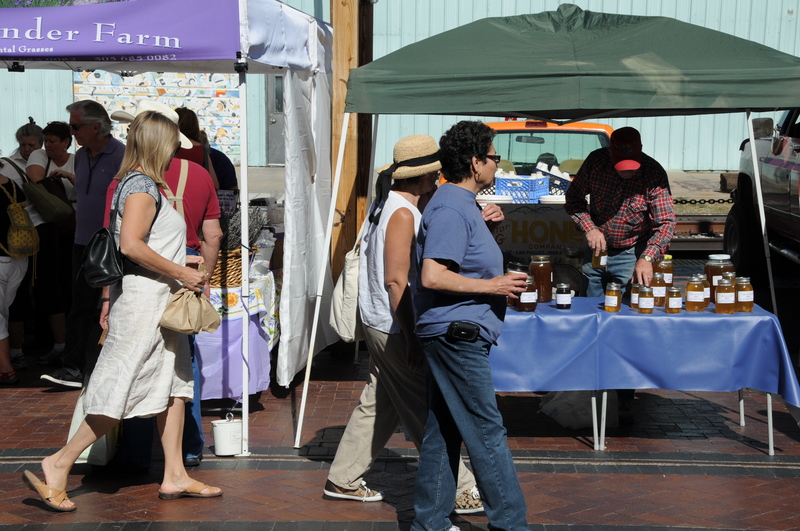 The Farmers’ Market meets all expectations for food and merriment and good all-around fun for a Saturday morning! I took photographs. 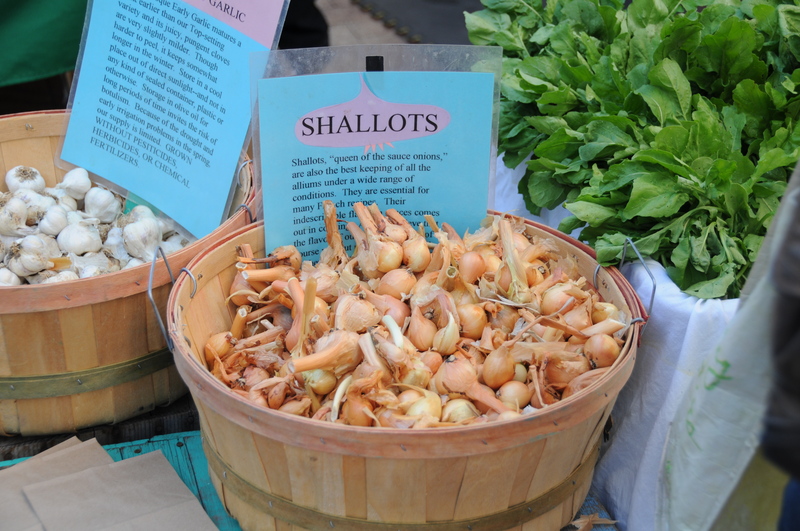 Brenda purchased garlic oil, leeks, dried apple chips, basket, a garlic chain and sage-lavender soap. We put the leeks in our cooler in the room under ice so that we could have leek soup when we returned to our ranch. 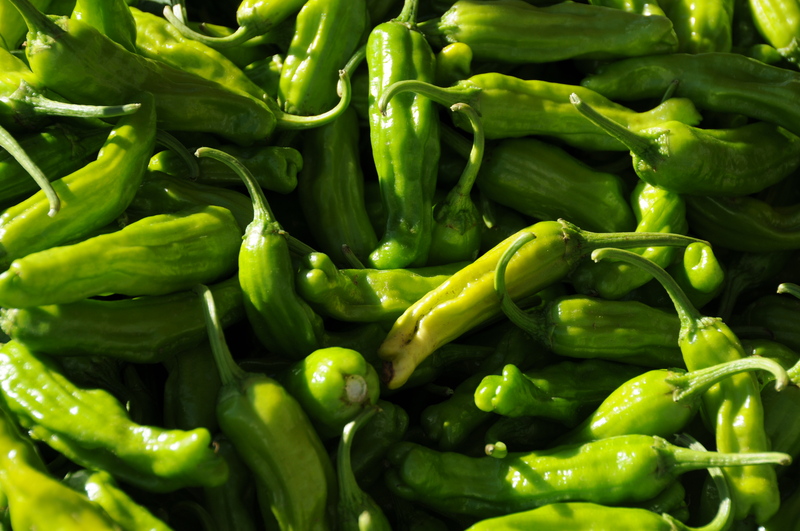 Chili peppers? 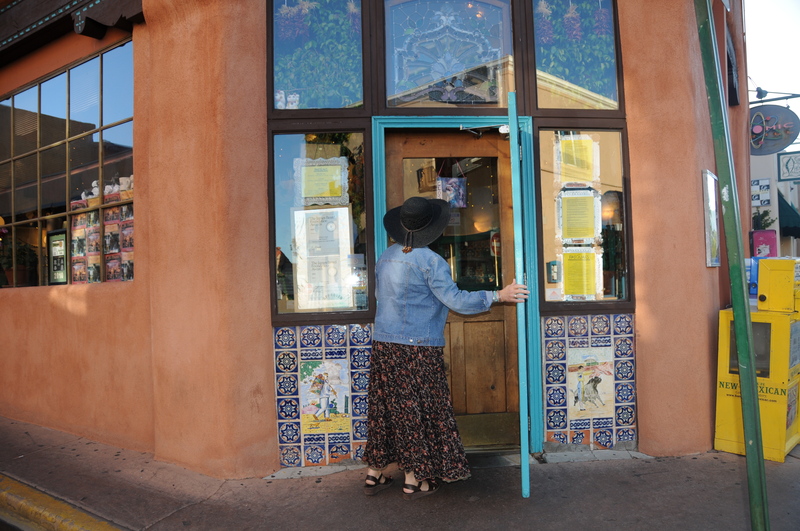 Well, we had them at every meal in Santa Fe, from Cafe Pasqual’s to Lumanaria. Oh, boy, how great it is, a movable feast in Santa Fe. Here are few more photos of the market. 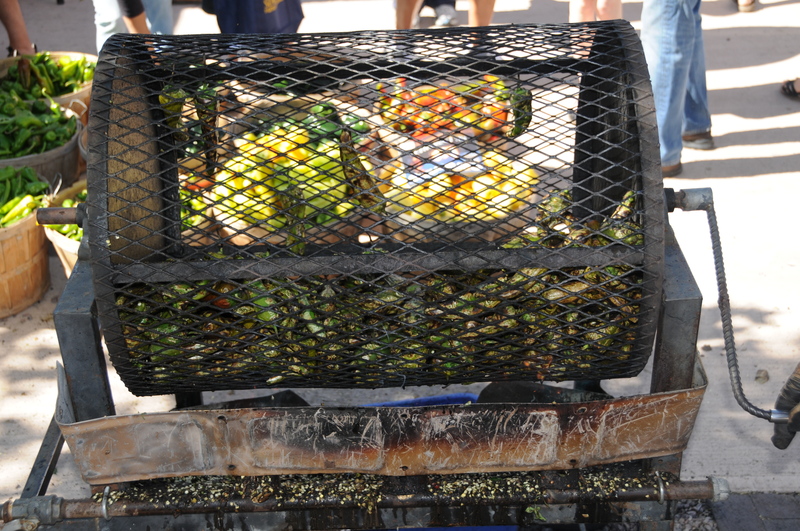 I’ve read some of my blogger friends lately that have hankered for chili and New Mexico. So, for you, here are some photos to whet you appetite before you book for travel. The Chef at St. Francis Hotel looking for fresh ingredients. 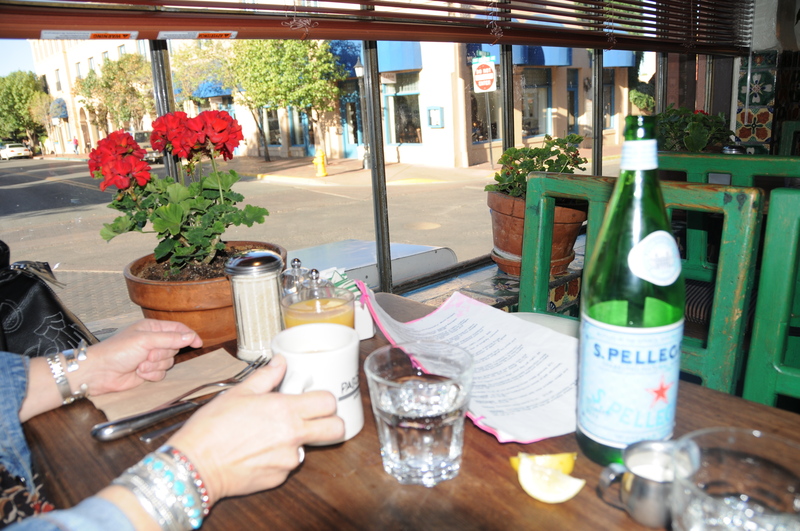 Brenda at Cafe Pasqual's before we went to Farmers' Market. Pasqual's did not open up until 8:00 a.m. We were there early, thinking it opened at 7:30 a.m. We went in and had a fine table because we were early. 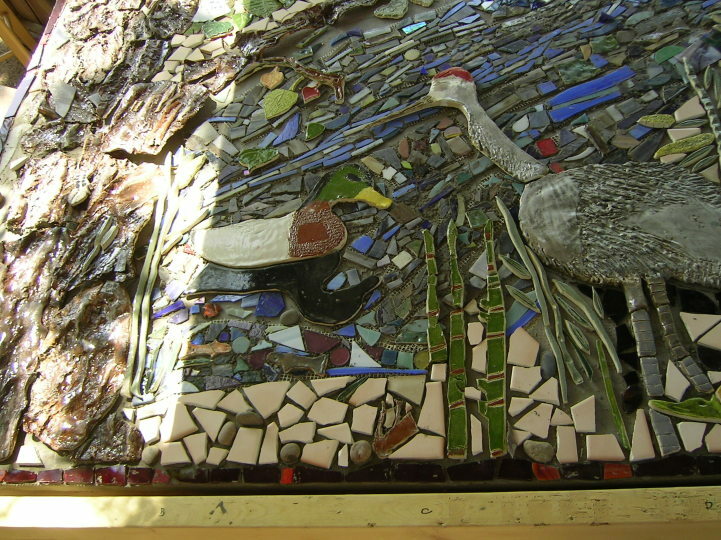 This is our table at Cafe Pasqual's. We had arrived early and were one of the first to be seated. We like the sparkling water and often take the bottle home to put fresh plants in so as to conserve the bottle and the energy spent to make it. Geraniums. Yes, geraniums. I have always had them around me. Mother grew them for as long as I can remember.